Your furnace provides the warmth and comfort you have come to expect from a properly working heating system. But sometimes it may be necessary to troubleshoot a problem with your furnace. Consider this as an essential part of managing the safety and comfort of your Columbus, OH home, but remember that repairs are best left to the professionals. Call Quality Air Heating and Air Conditioning today to schedule a check-up or furnace repair. Maintaining a clean and efficient furnace is part of keeping your home and family members comfortable this heating season. Determining what is wrong with a furnace can be a daunting task. A lot of factors contribute to the complexity of your home heating system, including whether your furnace runs on natural gas or electricity, the brand of your furnace, and the size of your furnace. That said, there are several indicators that your furnace may need some repair. If your furnace is simply not running, the problem may be at the heat source: it may have lost power, or fuel may not be igniting properly. If the furnace runs but does not sufficiently heat parts of your home, then the distribution system is not working. If the furnace turns on and off erratically, you may have a faulty thermostat or an oversized system. The three basic areas of the furnace system—the heat source, distribution system, and thermostat—are common places to look when troubleshooting your furnace. Remember that your furnace is a complex system that requires professional care and maintenance to run efficiently. 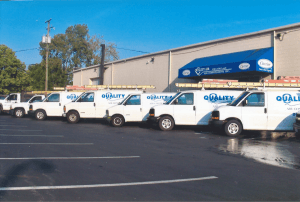 If you feel your heating system is no longer operating like it once did, it behaves strangely, or if you see or smell fuel, it is time you called in a Columbus, OH professional. Quality Air Heating and Air Conditioning is here to help, whether by routine maintenance or emergency repair, we can accurately and quickly determine what is wrong with your furnace and decide the best way to proceed. Call us today.